John Senders, in video stills, during his 1960s research. It’s a distinctively modern problem: the plague of distracted driving brought on by the rise of gadgets that allow people to talk, text, e-mail, or browse through thousands of songs while commuting at 70 miles per hour. Data from the National Highway Traffic Safety Administration show that the percentage of drivers distracted during a fatal crash has risen, from 7 percent in 2005 to 11 percent in 2009. The emerging safety threat has triggered national debate and new policy, including a law prohibiting texting while driving in Massachusetts. 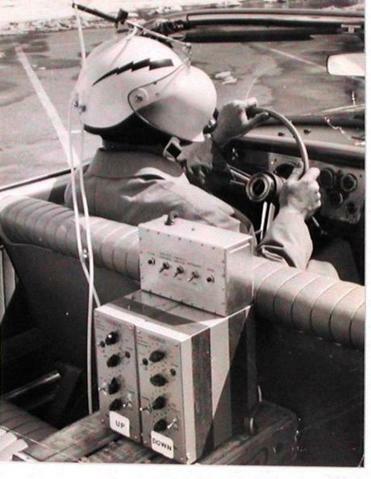 But long before text was a verb, back when technological temptations were limited to tuning the radio or fiddling with the heat, one man began a visionary quest to figure out how much attention was consumed by driving. In the mid-1960s, John W. Senders, a scientist at Bolt Beranek and Newman in Cambridge, drove into midday traffic on I-495 in a 1965 Dodge Polara, wearing a motorcycle helmet. The visor, its mask sandblasted into an opaque shield, was rigged to a pneumatic tube and periodically flipped down over his eyes. With the visor down, cars, lane markers, medians — everything but light — were completely invisible. Senders could see nothing, until he triggered the visor to lift for a fraction of a second. And that was the point. In the name of science, Senders and research subjects drove on I-495 and at a racetrack in southern New Hampshire. Senders even made a trip at rush hour from Belmont to Harvard Square. All the while, he was building a mathematical model of human attention. Even in that relatively innocent era, Senders saw a laundry list of distractions nibbling away at drivers’ focus: conversations, the rearview mirror, landmarks. “It is said that drivers become ‘road hypnotized’ — staring without seeing at the scene ahead,” Senders wrote in a scientific report published in 1967. Though the distractions of the era seem almost quaint, Senders’s work was prescient. A black-and-white video shot by a TV crew showing a demonstration of how the experiment worked seems preposterously hazardous—a steam punk parody of what drivers do when they glance away from the road. But Senders was serious, and today, “occlusion” tests using special goggles have become a standard tool to measure driver distraction and the safety of gadgets in cars. John Senders receiving his Ig Nobel Award at Harvard last month. 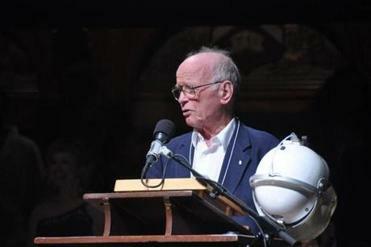 Today, Senders is 91 and an emeritus professor at the University of Toronto. He recently won an Ig Nobel award, which honors humorous achievements in research. Ideas spoke with him by phone. IDEAS: How did you get interested in this question? I reached back in my memory and went back to 1952 — an event that happened to me when I was driving from the Air Force medical lab in Dayton, Ohio, to Cleveland, Ohio. I was in a heavy rainstorm, and the windshield wipers only cleared a very small sector . . . I got a periodic repeated view of the world through about 8 square inches of clear windshield. And I found, to my surprise, that with the windshield wipers going at a constant speed I could go 32 miles per hour, but if I went 34 miles per hour, I was immediately unhappy — felt distressed and overloaded and had to back down. IDEAS: What equipment did you use to replicate this? SENDERS: What I did was to take a motorcycle helmet and sandblast the visor so it would let light through, but not the detail . . . . Then we had a rather primitive vacuum tube time generator with controls on it, so that whenever it raised the visor it would keep it up for a quarter or half or three-quarters of a second or a whole second or whatever. A switch would trigger it and that we stuck on the light switch — in those days, the headlights had a dimmer switch, operated by the left foot, high beam or low beam. It was on the foot — we didn’t want to mess with driving. SENDERS: I was trying to find out how much attention is required for just driving down the road, because what’s left over could be construed as the safe reserve that you might have if something unusual came up. We were able to measure how much time a driver had to spend looking, as a function of the speed of travel. And the faster you go, the more often you have to look. That doesn’t surprise anyone, but we at one point ran the delay between looks up to 9 seconds, and two people were able to drive with a half second look every 9 seconds. They couldn’t go very fast, but they drove. And then one person refused to drive at all. She couldn’t move. So that was about the limit. IDEAS: Did you ever have any accidents? SENDERS: No, not at all. We did begin to notice, the drivers who might pass us would become distracted by the view of someone who was driving without looking. It was clear that stole a bit of attention. IDEAS: How have things changed in today’s cars? SENDERS: In those days, automobiles would have a radio. They would have heater controls, might have air conditioning. They would have things like a light switch, turn signals, oil pressure, speed. Odometer, how many miles have I gone . . . .Then there are other things that became available — radio, air conditioning, CD players, or anything of that sort — these were just added. These obviously take some attention, and that means that they could interfere with the driving process. If someone is in a driving situation that requires 80 percent of your attention and you find that the tuning of the radio is 25 percent, then you’re overloaded. IDEAS: Do you think people are exceeding their ability to pay attention? SENDERS: I think a lot of people are challenged by the system. If you’re driving in a situation where there’s pedestrian traffic, bicyclists crossing roads, the frequency of lifting the visor would go up . . . .You might see a pedestrian approaching the road, and that means you have to look at that pedestrian . . . .That’s the major problem — not that you always look at things that are there, you have to look at things that might be there. IDEAS: Back when you were doing these studies, did anyone care? SENDERS: When I was doing this, nobody was paying attention to it. IDEAS: Have you found the amount of attention needed varies with age? SENDERS: This would be a very useful and interesting experiment . . . By and large, what you get is some slowing of neural machinery . . . .There’s a possibility I’d look for longer intervals at the age of 91 than at the age of 42, 43. IDEAS: Has your research made your driving better? SENDERS: My wife wouldn’t say so. I tend to be a rather aggressive driver; I get annoyed at the turkeys. How can I fly like an eagle when I’m beset by turkeys? Carolyn Y. Johnson can be reached at cjohnson@globe.com. Follow her on twitter @globecarolynyj.